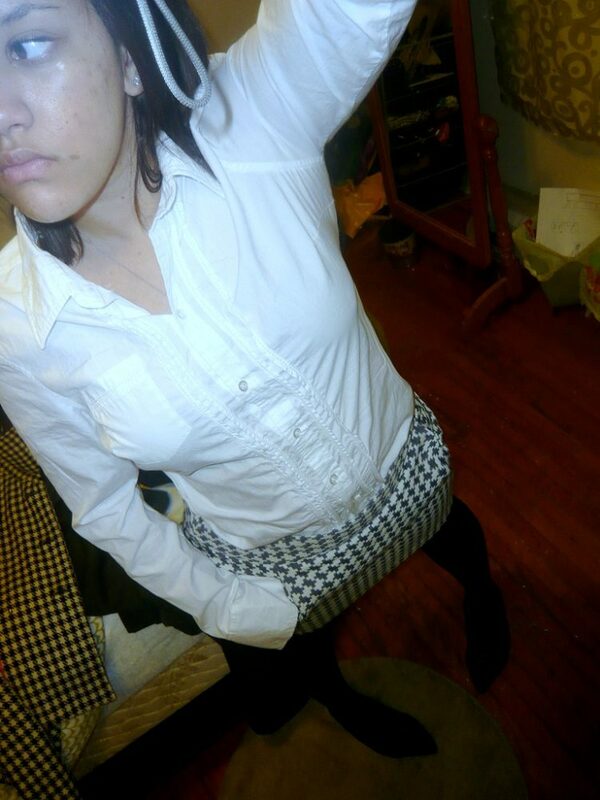 I’ve had a problem with the underarms of my white shirts turning yellow for years. Depending on how much you sweat, the yellow armpit stains can show up after only one wear sometimes — and who wants to toss out a brand new shirt, right? We all hate it. Most of us have at least one shirt hanging in the closet that we don’t wear anymore — because of those nasty yellow sweat stains. How embarrassing would it be to lift your arm and have someone see those yellow underarm stains?! So, if you want to remove sweat stains naturally, below are a few things that have worked for me. Also, I’ve found 2 great ways to prevent sweat stains in the first place! Interestingly, the best “natural” way to prevent armpit stains that I’ve found is to stop using antiperspirants. I stopped using anti-perspirants 5 years ago when I read about a possible increase in breast cancer to women who shaved their armpits and wore antiperspirants with aluminum in them. The evidence suggests that switching to a deodorant (ideally, an all-natural deodorant) can help with the odor that is caused by perspiration — and it may even prevent armpit stains that become nasty yellow in color. I’ve been using Tom’s of Maine deodorant in lavender — and I haven’t had any more issues with yellow underarm stains! Another thing that helps prevent sweat stains is to eat a healthier diet. When your body isn’t forced to get rid of all the preservatives and other chemicals found in processed foods, there are fewer toxins in your sweat to cause the yellowing. Eating better can actually help to reduce both — the odor and the severity of the yellow stains. Okay, now that you know how to prevent underarm stains from appearing on your shirts in the future, let’s talk about what you can do to remove the yellow underarm stains you already have. First, pre-treat the yellow underarm stains in a solution of 2 parts lemon juice to 1 part table salt. Then hang the shirt to dry outside in the sunshine. The sun will naturally bleach the stain away. Finally, wash the shirt as you normally would. TIP: Do not put armpit stained shirts in the dryer after washing! Doing so will set the stain, making it harder — if not impossible — to remove underarm sweat stains. Place your shirt in the washing machine. Add 1/4 cup of vinegar and enough water to cover the clothing in the washer. Agitate to mix the vinegar and water. Let it set overnight. Then, wash the shirt as you normally would. Pour vinegar directly onto the yellow armpit stain, and rub it into the fabric very well. Then, wash as usual. Pour vinegar directly onto the yellow sweat stain, and use coarse salt (or just regular table salt) to scrub it into the fabric. Then, hang the shirt outside in the sun to dry. After it’s completely dry, wash the shirt in the washing machine. I’ve found that baking soda — on its own — doesn’t work all that well to remove yellow armpit stains. But when you combine baking soda with other household items (like hydrogen peroxide and/or Dawn dishwashing liquid), you get a powerful sweat stain remover! Mix 2 parts hydrogen peroxide with 1 part Dawn dishwashing detergent to create a paste. Apply this paste thoroughly to the yellow armpit stains. Sprinkle some baking soda onto the stained areas as well. 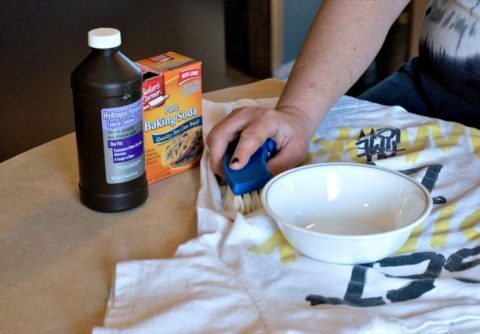 Use a toothbrush or household scrub brush to work the paste into the fibers of the shirt. Let the paste set overnight. Wash the shirt alone or with other white clothes (but not darks — because hydrogen peroxide reacts like bleach does on colors). 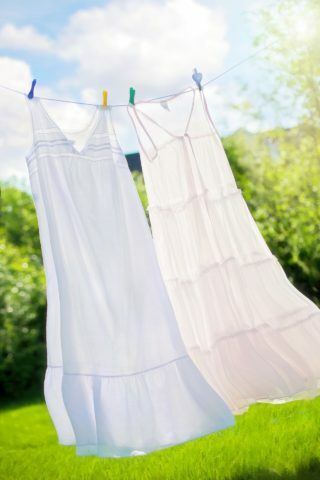 As you can see, there are several natural ways to prevent and remove yellow underarm stains from your white shirts. Trying just a couple of these techniques should solve your problem. By the way, another common household laundry product called Oxiclean is also effective on yellow sweat stains. In fact, the men’s grooming site called Art of Manliness claims it’s the best at removing perspiration stains! Generally speaking, Oxiclean is a great alternative to regular bleach. There are lots of Oxiclean stain removal tips. Does A Clinical Strength Deodorant Really Work Better?